Lusaka residents affected by the contaminated water two weeks ago are demanding for more punitive measures against the Lusaka Water & Sewerage Company for negligence. The water which should ordinarily fulfil ‘water is life’ motto becomes hazardous and a threat to your very existence due to negligent attitude by the providers. Such is the plight that a number of Lusaka residents recently faced when they woke up one morning to find that their drinking water was contaminated by faecal matter. “We hope Lusaka Water and Sewerage Company (LWSC) will be penalised and put in its place for the unprofessional conduct that led to the contamination of our water. Their negligence put the lives of residents at risk when they allowed sewer affluent to contaminate our drinking water,” laments a Nyumba Yanga resident. The residents claim the ‘mare rhetoric’ by the National Water Supply and Sanitation Council (NWASCO) through the issuance of a press statement to outline the negligence, and the subsequent apology given by the water utility company will not erase the trauma of ill health and inconvenience they have suffered in the past weeks. Life and Entrepreneurship Coach, Steady Devine, who resides in the affected NAPSA complex in Nyumba Yanga, and usually appears confident, motivational and sometimes controversial, today looks nothing like his attributes as he appears frail, fragile and vulnerable. “Personally, I think I stayed down for over a week with the bug that hit us. So, it was diarrhoea, vomiting and all that. In fact two other people in the house who are my son and nephew were also affected. I did engage the LWSC spokesperson who was very adamant. The following day he was on radio where he denied the allegations of contamination that affected our area,” complained Devine, saying when he went to the hospital he could not stand because he was so dehydrated and weak. The Life coach said it was sad that the plague affected over 130 households in the Nyumba Yanga complex and yet the LWSC kept denying the reports. LWSC Public Relations officer Nshamba Muzungu was quoted on various media platforms vehemently denying the allegations and claiming they were fabrications of fake news. “We would like to put it on record that the statement going round alleging that the water being supplied by the utility company is contaminated has not come from us and should therefore, not be regarded as our position” he said during one radio interview. “We would therefore like to advise the members of the public to ignore the message going round”. In his public statement, Muzungu pointed out that it was not possible for the utility company to supply contaminated water because it is part of the Cholrea Multi Sectoral Response Team that plays an integral role with a key intervention of supplying clean water in cholera affected areas. “The company always undertakes water quality surveillance on a daily basis and quality control measures are in place to ensure that the water supplied meets the standards required by the regulators” he assured. Muzungu’s statement is backed by a 2018 Ministry of Health report, which outlines the response that was undertaken to mitigate the Cholrera outbreak that occurred in Lusaka during the same period last year. “In Late December 2017, a number of water related preventive actions were initiated, including increasing chlorine levels throughout the city’s water distribution system and placing emergency tanks of chlorinated water in the most affected neighbourhood,” the report outlines. The report confirms Muzungu’s assertions that the Ministry of Health (MOH), with partner organisations like Zambia National Public Health Institute (ZNPHI), the Zambia Field Epidemiology Training program (ZFETP), the World Health Organisation (WHO) and the Africa Center for Disease Control and Prevention in conjunction with the Lusaka Water and Sewerage Company (LWSC) collaborated to implement the Water Resource Monitoring Programme. 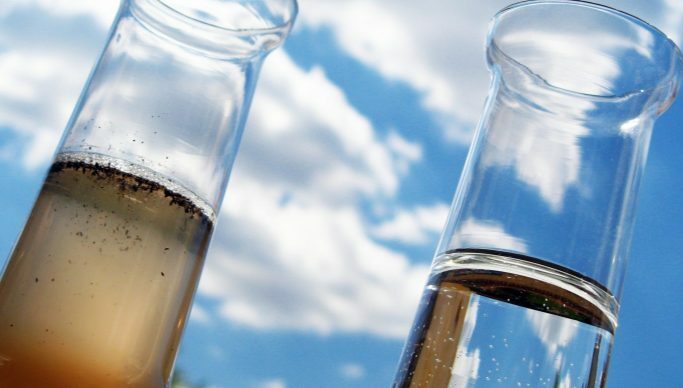 “The programme was to test randomly selected drinking water sources for faecal contamination. Approximately 220 randomly selected water sources in areas across Lusaka affected and not affected by Cholera were tested in January 2018,” reads the report in part, stating that results were provided daily to the group which included LWSC. If the report is anything to go by, then one can deduce that LWSC was well equipped with information that would have allowed it to adequately manage and mitigate any unforeseen circumstances in the supply of clean water in Lusaka. The findings of the report clearly indicated that the supply of chlorine in the Lusaka water tanks was inadequate, thereby escalating the spread of cholera last year. “In total, 160 (73%) of the 220 drinking water sources tested had inadequate levels of free chlorine residual (0.2 mg/L); 41 (31%) of the 160 water sources with inadequate free chlorine residual were positive of E.coli. The most commonly contaminated water sources were shallow wells (91%) and Boreholes (34%),” states the report. In view of this, it is ironic that LWSC was found in such a predicament, especially that they initially denied the unofficial reports that had been circulating. So, one wonders why LWSC was ‘caught napping’ on the issue, living many residents with unanswered questions? Perhaps, the answer was best described by NWASCO acting Director of Engineering Peter Mutale, who may have hinted on LWSC negligence in his press briefing of Thursday 9th January 2019. “A borehole located inside NAPSA housing complex in Nyumba Yanga had no chlorination system fitted on it while two boreholes located on the periphery of the complex belonging to Lusaka water and sewerage had frequent blockages,” he disclosed, further emphasising “that the chlorine residual applied in the two boreholes during the time was generally low and below the minimum required standards”. Mutale said the sewage over flow is believed to have occurred between the 29th and 31st of December 2018 and advertently flowed in the direction of the boreholes, stressing that the situation could have been worsened by the heavy down poor, storm water runoff coming from the city’s poor waste management system. And perhaps, in a bid to re-emphasise his remorse after the NWASCO findings, LWSC managing Director Johnathan Kampata publicly apologized to Lusaka residents for the water contamination. Speaking when he appeared on a live radio show, Kampata said the water utility company regretted the incident, pointing out that his company was doing everything possible to ensure the problem did not re-occur. “We are very sorry for the water contamination that some Lusaka residents experienced in the last two weeks. To manage this, we have since increased the dosage of chlorine in the water at the source and worked on all potential leakages in order to protect the water from being contaminated again. We have also fenced all the water source reservoirs and sealed them from trespassers,” he said. However, it seems that what the Lusaka Water and Sewerage company was trying to do in mitigation, may have been a case of ‘too little too late’ because affected residents seemed to have lost trust in their water benefactor, especially that the 2018 Ministry of Health cholera report gave an indication that the utility company was going to be pro-active rather than reactive to this kind of situation. “It was so bad, vomiting and diarrhoea all over. I had to take my family of six to Chilenje clinic even though these people were refusing the allegations at first,” says Absolom Nawa also of Nyumba Yanga complex. “Just this week a truck passed by distributing chlorine and we are told that we even need to boil our water for brushing teeth sure, this is pathetic” he said “Just heard on radio that bills for this month (January) have been scraped off but there has been no written communication. We are told today (Saturday 11th January 2019) that they were scheduled to come over and talk to us, but no! I’ve been home all day, didn’t see anyone, maybe they went to selected homes of their relatives,” he complained. Nawa narrated that it is scary that the utility company is not clearly communicating on the way forward thereby creating more mistrust and anxiety. The paranoia has also spread to other affected areas like Ibex Hill and Kabulonga’s Malata area where residents like Lucy Munthali posted a picture of a sink filled with dirty water on her Facebook page and retorted “I am afraid my neighbourhood has also been affected by this water contamination. Running water from the tap is now colour brown with a lot of sand”. A cross section of society has accused LWSC and its regulators for being negligent by not taking action to prevent such scourge and yet they are well equipped with information, at least from their monitoring reports over a period of time. “NWASCO came in a little bit too late. I actually spoke to them when they came on the scene. I thought they were not very quick to respond. I think the Ministry of Health inspectors were the quickest to respond and came to give us chlorine because they were on the ground as soon as they got the report. So NWASCO should now be able to take action since everything has been confirmed,” complained Devine. And Opposition Green Party president Peter Sinkamba also added his voice on the matter by attributing the provision of poor quality of water to weak regulatory and institutional framework in the country. Reacting to the reports of poor water quality supply in Lusaka, Sinkamba bemoaned the weak drinking water quality guidelines and standards which resulted in water borne endemic diseases such as cholera and dysentery last year. “As the Green Party, we are extremely worried with the status quo where the country lacks an institutional and legal framework to provide adequate oversight on provision of quality water and sanitation services in the country,” Sinkamba said. He continued by pointing out that “We have the Water Supply and Sanitation Act of 1997 which establishes NWASCO. Though the Act empowers NWASCO to establish and enforce water supply and sanitation services, including establishing and enforcing drinking water quality standards and guidelines, this institution has failed to do so in the last 10 years or so. Sadly, the focus for NWASCO is merely issuance of licences to utilities and approval of exorbitant tariffs and other exploitative charges. And this is our point of departure,” he said. Perhaps the lamentations by the residents and relevant stakeholders should not be taken lightly because in its 2018 world health report the World Health Organisation (WHO) has pointed out that “diseases due to poor access of clean drinking water, unimproved sanitation and poor hygiene practices cause 4.0% of all deaths and 5.7% of all disability or ill health in the world. The report further explains that “though “about 80% of the urban dwellers have access to piped drinking water and 96% have access to improved drinking water sources, often bacteriological quality of this water still remains poor; more than 50% of urban residents in developing countries are still affected at one time or another by disease related to insufficient access to safe drinking water and improved sanitation,” it reads. The Lusaka water and Sewerage Company must learn from this plague and realise that no one should gamble on another person’s life due to negligence. Indeed, water is a vital component of all living things. This is particularly important for humans because it makes up a majority of body weight and is involved in many important functions. Indeed, the utility company needs to rise up and take responsibility because it is the custodian of life. After all, as the saying goes ‘water is life’ for all… including the people of Yumba Yanga and Lusaka in general.